This recipe is a little ironic, isn’t it? 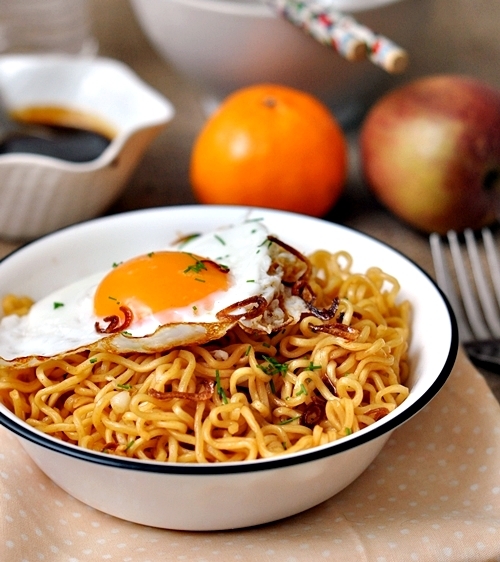 Normally, instant ramen tries to emulate home-cooked dishes but in this instance, I’m trying to emulate my favourite brand of ramen noodles – Indomie Mi Goreng, which delightfully to have earned a pretty good ranking from the Ramen Rater. So when I was savouring this, it was a walk down to memory lane for me. 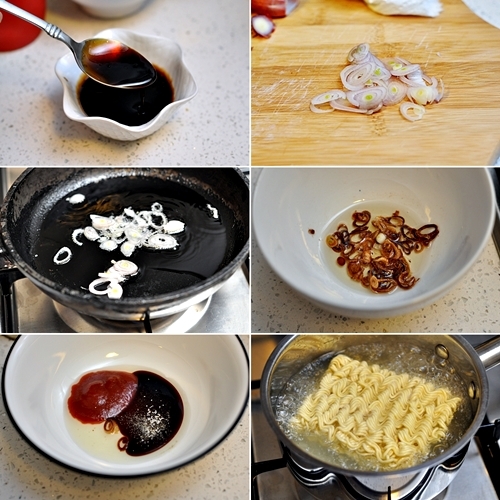 (1) Start with making the kecap manis if you decide to make your own. See here for the recipe and instructions. If not, go straight to step two. (2) Thinly slice a French shallot. Pat the sliced shallot with a paper towel to absorb excess moisture before pan frying. (2) Add 2 tbsps of cooking oil and shallot over medium flame. When the shallot starts to sizzle, lower the flame to low and fry until golden brown as per photo above. Set aside in a bowl to cool. (3) In a bowl, add 1/2 tbsp shallot oil, 3 drops of sesame oil, 1/2 tbsp tomato sauce, kecap manis, white pepper and salt and mix until well combine. Set aside. (4) Cook noodles in boiling water according to packet instructions. Once cooked, toss the noodles with the sauce until well mix. Sprinkle the fried shallots just before serving. 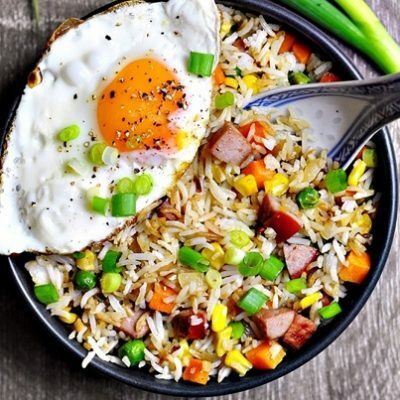 *Optional* top with a sunny-side up egg and vegetables of your choice. 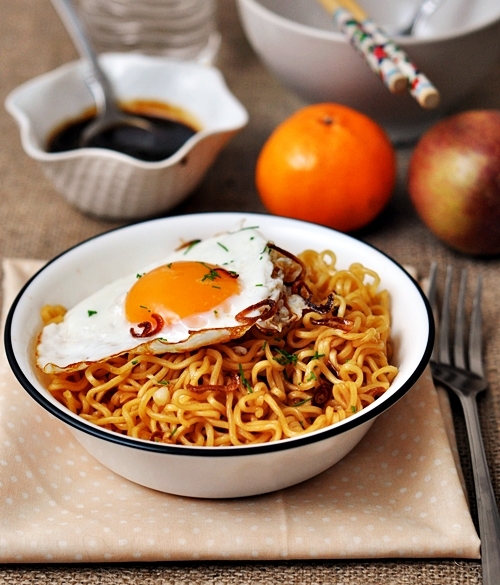 Note – just so you know the sauce may be on the sweet side because of the tomato sauce and kecap manis. I love my food a little sweet…so if you like yours on the salty side, add salt or soy sauce to taste. looks very yummy! will try this over the weekend. 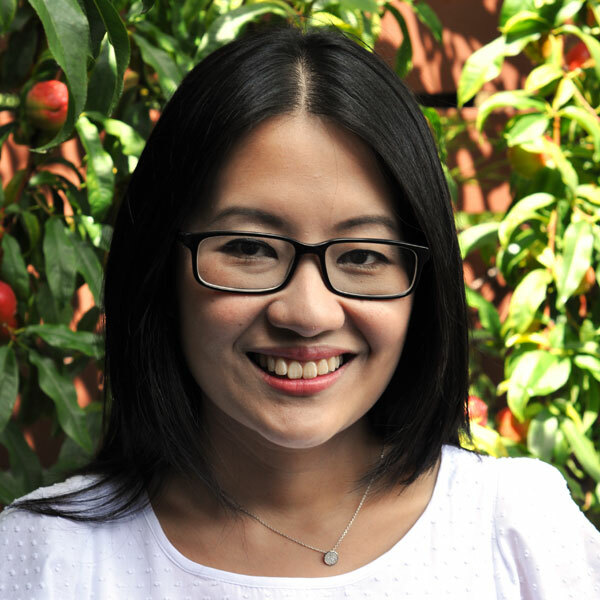 your blog is very informative and beautiful! keep it up! 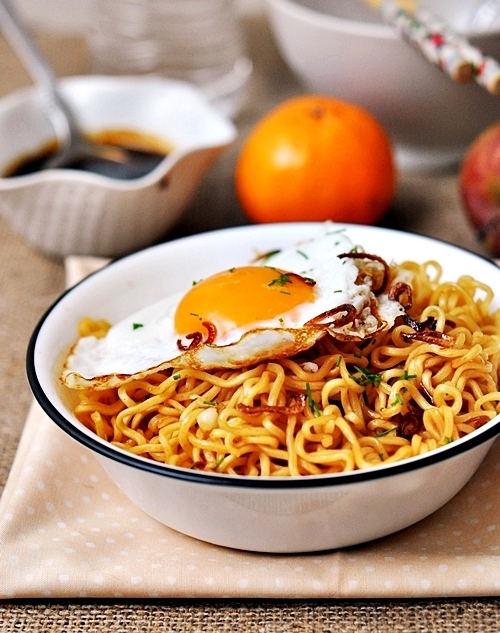 We always have instant mi goreng in the pantry– always Indomie. Now I don’t have to buy it; awesome!! 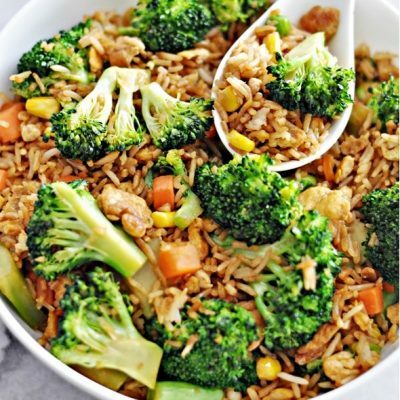 Looks so good and perfect for a quick dinner! Reminds me of Singapore/Malaysia/Bali…. Thank you so much for this wonderful food hack. I’ve been wondering for years how I’d go about making my own spice paste to substitute for when I have no access to Indo Mie (I no longer do for about 3 years now), but after this I think I’ll skip instant entirely. I used onions in place of shallots, and skipped the sesame oil as I don’t have that in stock, so it definitely misses some major flavours. But that’s the thing — it tastes good already..how much better can it be? 😛 As I’m a Singaporean living abroad, it brings back the local flavours I miss so much. P.S: I also added ginger and garlic pastes, 1/4 tsp of each. Hi, this looks pretty dang awesome! Did it really taste exactly like indomie or was it just slightly similar to indomie? Looks similar enough to indomie though haha good job! How was it different if I may ask? Is it less savory, less sweet, etc.. I mean indomie is famous around the world, must be tough to recreate the flavours.. Oh and one more question, how would you do it differently to make it better? Tried it, loved it. The kids loved it too! Made a large quantity to store in the refrigerator and used half ketchup, half sriracha – it was just right. 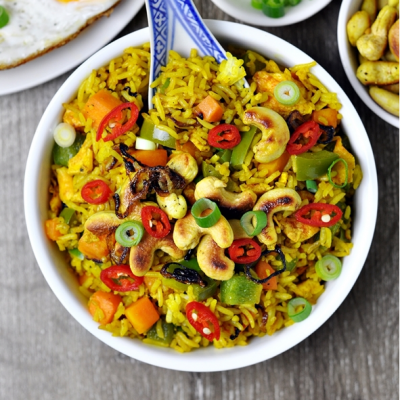 Thank you for this recipe – I cannot eat wheat, so I am trying to create Mi Goreng on rice noodles!! 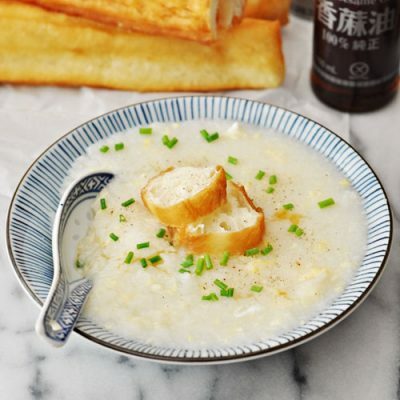 Is there a way to make this recipe in the US? Great recipe. Simple and lezat! I just made this and ate it til the bowl was completely empty. It was delicious! Better than the mi goreng packages my father used to make me, but similar flavor to bring back the nice memories of eating with him. 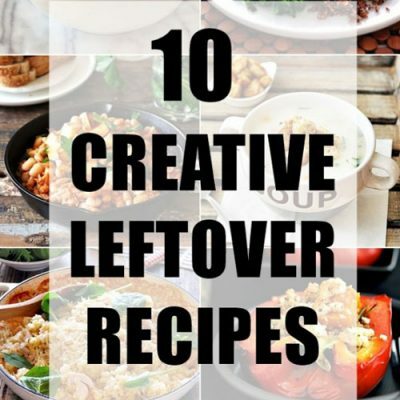 Thank you for sharing this recipe, it’s a huge favorite! I can’t wait to make it for my boyfriend. Just made this with dried udon noodles because it was all I had on hand. Amazingness with only half the guilt! That’s a nice recipe. It’s a bit of a waste to throw out the seasoning packaging though, and by buying the noodles, we would still be contributing to deforestation, haze, and habitat loss. Far better to use a couple of noodle cakes from a palm oil free (or responsibly sourced palm oil) noodle. These look mighty good! I will try making them this week. So easy and cheap. Yes, I will be good and not eat them too much. I’m a noodle-a-holic! I made the noodles today and they were delicious! I used organic coconut palm sugar in place of the brown sugar. I might add a bit of chili pepper to the sauce next time for a bit of kick, but overall the noodles were delicious and I inhaled them! Thanks for sharing! THIS TASTES SO CLOSE TO THE NOODLE PACKET ‘mie goreng’!!!!!!!!!!!!! I have craved this flavor but wanted to make it myself so i was on a mission to find the perfect recipe!!! I’ve tried 4 so far and this one is THE MOST ACCURATE!!! So simple and so good!!! Thank you so much for posting this magical combo of ingredients!!! I’m going to subscribe to your blog!!! I used ABC brand kecap manis, added a bunch of minced garlic with the shallots, added more soy sauce [don’t like my mie goreng too sweet]. Added dried/cooked/fried onion on top. Used egg noodles that look like the ones that should be crispy? I just moistened them with 1.5 cups of water and put to the side until I fried up the shallot and garlic.